This was the first commemerated. Released for sale in the fall of 86, as a 87 model year. The NSR 2-stroke 90 degree V-Twin single crank engine layout is similar to it's predecessor. Taken directly from the NSR500 and 250 works machines, the air intake is tilted forward at 20 degrees with a valve reed intake system. Carburetors are a 28mm flat sided style. The RC Valve exhaust system is continuously varied by a computer controlled timing system. The cylinders are hard coated with a nickle silicon carbide particles over the aluminum walls that provides extreme cooling capabilities at high RPM high performance output. The cassette type transmission provides great power in a compact lightweight design, while providing improved maintenance at the race track. The frame is a large cast aluminum front section, with extruded cross members main tube. The adjustable aluminum extruded swing arm is used to achive high rigidity. 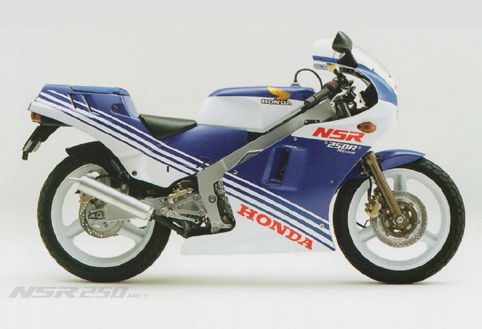 The first NSR became a huge hit at the time of release. 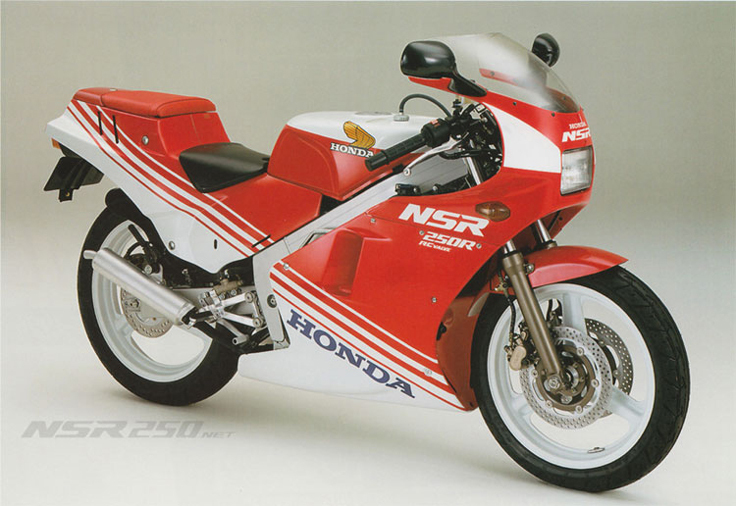 Honda achieved the top sales volumns over Yahama for the first time in 1987 for the 2-stroke sportbike market.